Only English works (original and translated) are listed here. 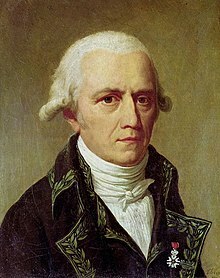 The vast majority of Lamarck's works were written in French; for French works, see Jean-Baptiste de Lamarck on the French Wikisource, or the bibliography of Lamarck at http://www.lamarck.cnrs.fr. "Sensibility of plants" in Tilloch Philosophical Magazine 1 (1798): 305–306. Children, J. G. (1822–1823) "Lamarck's genera of Shells, translated from the Histoire naturelle des animaux sans vertèbres" in The quarterly journal of science, literature and arts 27: 64–86; 28: 298–322; 29: 23–52; 30: 216–258; 31: 49–79; 32: 241–264. Dubois, Charles (1825) An epitome of Lamarck’s arrangement of Testacea: being a free translation of that part of his work, de l’Histoire naturelle des animaux sans vertèbres, with illustrative observations and comparative and synoptic tables of the system of Lynnæus and Lamarck. This page was last edited on 16 June 2018, at 01:35.